As many of you may have heard by now, Liam has had a set back in his recover as the Neuroblastoma has return and is currently in his brain. As we type, we are working with our primary team in Chicago and are also consulting with some folks in New York City on what options we may have. We have a tough battle on our hands, but we made it once and will make it again. Just a little background on the past few days since everyone is asking how this happened so fast. Liam has quarterly scans every three months to monitor his body for any potential relapse signs and he was due to have these scans in mid-Feb. Maureen and I made a promise to each other to always do something fun before the scans since you never know what may happen in life (it turns out to be a really good rule)! So on Monday January 30th, we jumped on a plane and headed to Hawaii. We landed late Monday night and woke up early and hit the beach and pool. Liam was in great form, swimming and running as fast as can be. We headed back up to the hotel room for a quick wash and then off to lunch. It was at lunch that Liam seemed a little off and even fell asleep at the table. With Liam sleeping in the stroller, we headed off for a nice beach side walk. Liam gave up naps a long time ago so it was a nice change of pace for Maureen and I to chat. When he woke up he was still not feeling to great, and we headed back to the hotel room. On the walk home, Liam threw up and said he was not feeling so hot so we hustled up to the room and got cleaned up and headed for a rest. The next day was filled with lots of vomit, and we were in touch with the pediatrician back home and thinking Liam had picked up the stomach flu at the birthday party on Saturday or on the plane. On Thursday morning, the vomiting started to get better and we thought we were catching a break. Later that night, things started to change and Liam started to have a very intense headache. We reached out to our pediatrician and worked over a few options, most of them were run of the mill stuff but we also had some scary things out there and she recommended heading to the er for hydration if things did not clear up by the next day. Friday February 3rd, we decided not to waste any time and just headed to the er at the children’s hospital in Honolulu. We started with some hydration since Liam didn’t have a lot to eat of drink. Given our history and the intensity of the headaches we got a CT and some x-rays. A few moments after the test results were back, the ER attending informed us in very blunt terms that Liam has a tumor in his brain and it was bleeding. The ER consulted with Neurosurgery and they opted to intubate, some sedation and an MRI to see what the was going on in Liam’s brain. As you can imagine the next few hours were brutal, we were very lucky to have one of our oldest friends (Brendan Smith who lives on the island) with us to keep us from totally losing our minds. Our first move was to get off the island and back to the hospital in Chicago. After reviewing everything, Neurosurgery cleared us to fly and we booked three tickets on the next plane out of town. Brendan drove me back to the hotel to pack our stuff since we were about 10 hours from take off. When we returned to the ER Liam was resting and Maureen was working with our doctors back home on a plan for when we land. It was about that time that the ER attending came in and told us he decided he was not going to release us and that if we decided to try to fly with Liam he would die. He mentioned two other doctors at the hospital had been involved in the decision. We demanded to speak to everyone and got our doctors in Chicago on the phone. After several intense conversations, it became clear the ER doctor was the only one that held the opinion. Sensing we may be trapped on an island by this one individual that did not have the means to treat Liam (they could not even give him platelets) , Brendan, Maureen and I even discussed just breaking out of the ER. After battling Maureen and our Doctors back home, the ER attending agreed to release us if we waived him of any responsibility (which we did). We got out of the building as fast as possible and Brendan drove us in the middle of the night to the airport. When we got to the airport we learned that it did not open for another three hours, so we huddled up outside and starting making plans for our arrival. The only three tickets open on the flight out were in first class so that actually worked out really well as far as space for us to care for Liam. We alerted the flight crew to the situation and gave them the numbers to call should anything start to happen. The staff and crew of American Airlines was amazing, they earned our lifetime business for how amazing they were. The airplane prepared to depart and the cabin doors closed and pressurized. Liam grabbed his head and started to scream as the plane was backing out. Maureen and I asked Liam about the pain and were getting ready to stop the plane, when Liam said in a very strong voice “I’m ok, I’m gonna be ok!” He was not comfortable so Maureen gave him some morphine and that seemed to settle his pain. It was an insane start to an insane trip. WE battled very bad flying conditions, LAX, layovers, pain, fear and exhaustion (we had been awake for 35+ hours at that point) and arrived around midnight on Saturday. After we arrived at Children’s in Chicago, the team started to inform us of the testing schedule so we could get a better read on the situation. The CT and MRI here gave us a better look at what was happening and we have been working over the past 30 hours to put a plan together. We are going to fight this relapse! We still have more tests to do in the coming days to get a complete picture, but the first battle begins tomorrow February 7th at 10:00 am. We need all your prayers as Liam is heading in for brain surgery to remove the neuroblastoma mass. His body is not in ideal condition for this to take place as it has not fully healed from his last battle. He has one of the best Neurosurgeons in the county doing the operation tomorrow. The procedure may take most of the day, so any moment you have please stop and say a prayer. When we get a chance to catch our breath, and get some more of the test results we will try to update everyone with some better information and less run on sentences. Thanks to everyone for the love and support, we are spinning right now and need all of you! One of the greatest advances in Pediatric cancer is the Central Line. 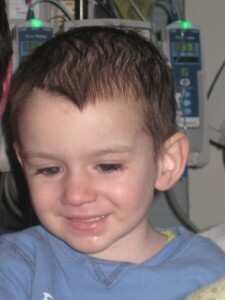 It has allowed Liam to receive hydration and iv antibiotics at home. He has rarely needed an IV started in his little arms. We were able to have blood drawn day after day without any painful needle sticks. Our love hate relationship was a good one that ended October 7th when it was surgically removed a HUGE milestone for us. It cements in our lives that we are done. Sure we will have blood drawn monthly and have an iv placed when we are doing scans but the everyday flushing, maintaining, weekly dressing changes and bathing restrictions are done! I took maintaining Liam’s line very seriously. Infections of the central line can be life threatening. So it was a fair bit of luck, prayers and my near obsessive line care that kept us safe. Liam’s counts are recovering slowly but that was the predicted recovery from back to back bone marrow transplants. We left it up to chance whether his central line would be removed before or after our Wish Trip to Disney World. Liam’s counts were good enough and it all seemed to fall into place as if we planned it. It would have been a huge bummer to have a central line while on vacation but with a little help from above it all turned out perfectly. It took Liam 3 days to notice that his tubies were gone. We didn’t talk about them with worry he might be upset. I wish I had video taped the moment he noticed it was adorable and he was very happy to not need them any more. With pride he shows off the scar on his chest where they once were. We have never told Liam that he had cancer. 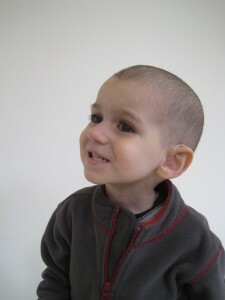 I bet he would recognize the word neuroblastoma but he has know idea that is what he had. I plan to keep it that way until he asks specifically. He knows he was super sick and that doctors and nurses helped his body fight to get better. I answer questions creatively and I give no more info than he requests. The idea that Liam may not remember any of the pain he endured is such a blessing. That would be the best case scenario. We are always working to write over bad memories with great ones. We are attending our local Catholic school 3 days a week from 8-11am. It is such a great thing on so many levels. Liam and I have been more attached at the hip than your average toddler so we figured the transition would be a weepy one. The first day there were no tears, I was shocked. Day 2 wasn’t so easy but the teachers at Liam’s preschool are fantastic. Gratefully they are super experienced and have a cuddly response to kids that need a little extra attention. Liam and I had a deal. After drop off I agreed to sit outside and wait for the day to be through. Truthfully I waited for the door to close and I scurried home returning without Liam being the wiser. Whatever works, right? My favorite day was when Liam said I could go home out of the rain. The teachers have my number near the phone in the classroom in case of anything exciting. The chest tubies were still in and we have to be a bit more cautious than the average kiddo. But his excellent teachers are so great with the curve ball they were dealt. I have confidently dropped Liam without any problems and every day he bursts out of school with pure excitement. 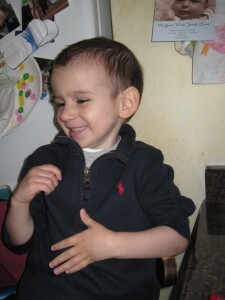 We have chosen to omit Liam’s medical history from his classmates. We think of this as a fresh start and besides wearing hearing aids and being petite there is nothing that shouts cancer anymore. Liam is blending in perfectly, before we knew it school drop off was more fun than tears. He is more independent at home then ever before it is so fun to watch him bloom. 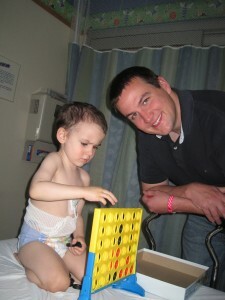 One day I am going to sit down with our calendar and count out every night we spent at Children’s Memorial Hospital. 4west became a second home. 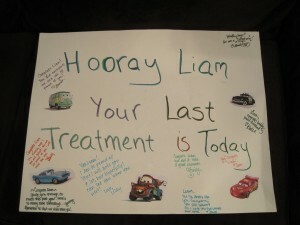 It is amazing that Liam adapted so well and made friendly with the nurses and doctors and all the other staff. Liam was frightened beyond belief of everything and everyone in March of 2010. I didn’t believe our Oncologist when he said that someday Liam would run happily through the halls as cancer treatment and hospital live is the norm. He was right. It was such a relief when Liam started to relax in the presence of a medical team, and when taking a blood pressure would no longer make him panic. The reality is that adapting positively made everything easier. Transitions to anything can cause stress and I won’t say that he missed the hospital when he was home but it was routine that he tolerated. We would frequently be admitted to the hospital on Sunday nights usually for a week at a time the longest being a consecutive month stay. We would always try to have a fun day without any mention of the admission and then sort of surprise the little fella. It was usually a sad realization but Liam is always a roll with the punches kind of kiddo. Our last planned stay at children’s ended June 23 we were lucky to complete the full antibody therapy without much incident. At home we still had to give daily injections for a week and lots of pills everyday but the most important part was the freedom to be home. Liam learned how to swallow pills that grown people would have trouble with(such a champ) Our visits were still pretty frequent for assessments and Blood or Platelet transfusions. It seems like from that day on we have made only positive strides toward returning to ‘normal’. The nightly iv hydration stopped on July 15th. 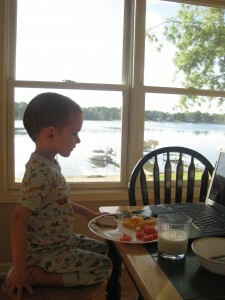 Liam began eating with more vigor and we worked hard to have every calorie count. (The lightest Liam was through all of his treatment was in March 2011 at 23lbs, and I will with pride tell you that he gained a phenomenal 10lbs in the last 8 months. For you or I 10 pounds is like an over indulgent weekend but for my little man it has made all the difference.) The oral cycles of Retinoic acid continued through August 7th. That was a remarkable day. The thought that the yucky side effects are finished and Liam could start repairing all the damage done by his life saving treatment was unbelievable, we have been so blessed. So, in August we started a testing schedule of every 3months for 2 years. We took our first well deserved break to Michigan with the blessing of all our doctors and a quick call by a cautious mommy to the local hospitals. We truely didn’t miss a beat with treatment ending in time to start preschool august 30th. July 10th we celebrated Liam’s Half Birthday. On his 3rd birthday(dec 15th) we had only been home from his second bone marrow transplant for a few days so we only thought it would be right to celebrate with some strength in the summer. It was a gorgeous sunny day and we had some of our best buddies in attendance. Please join us on October 15, 2011 at the Irish American Heritage Center for a very special evening with a variety of dinner options and a cash bar. Enjoy the live music and dancing while you browse the silent auction and the many raffles we will hold! Don’t worry about a babysitter, as we’ve reserved a separate kids’ room to keep the little ones entertained. The event will kick off at 4:00 pm! Do you run a local business? Would you like to be listed in the silent auction book? We’re accepting sponsors for this event! 60056-0257 Contact Katie Smith at Katie@liamsgang.comWe’ll also gladly accept non-cash donations! The First Liam’s Gang Golf Outing was an all around success. The weather held better then we all expected and with the sun came some excellent rounds of golf. We had over a hundred people from all parts of our lives, men and even a few ladies. The crowd was perfectly mixed. Some who hadn’t been out in years and others that golf on a more daily basis. 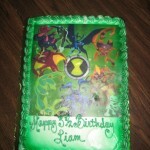 The main theme was supporting Liam and having a lot of fun at the same time. Liam and a few of his cousins. This day was Liam’s big reveal, It was so exciting for us to reintroduce our boy in such a great way. I felt the suprise in everyones response to seeing such a ball of energy. Liam hasn’t seen such a group in at least a year. 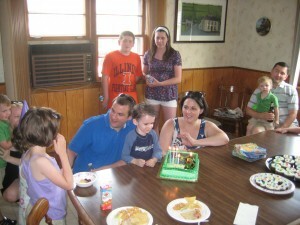 He was a touch shy to begin but was happy to have friends and cousins to warm him up. 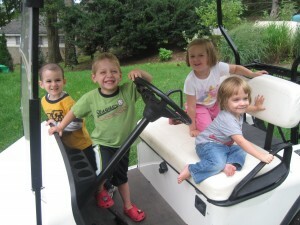 Liam loved cruising around in the golf cart playing hide and seek and being a bit of a celebrity. We are all truely working together to make sure Liam isn’t cheated out of his childhood. Whether you are blessing us with Prayers, positive thoughts, donations, toys, books, inspirational cards or well wishes it all leads to peace of mind, knowing we are supported from all directions from around the world. We are so lucky that Uncle Mike (Maureen’s brother) and Auntie Colleen wanted to plan and run this event, it was such a perfect way for us to start raising money benefiting Liam. Mike’s golf skills impressed all of us as there were only a handful that gave him trouble in the beat the Pro challenge. 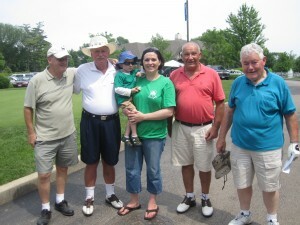 A big thank you to the Kelly, Murtagh and Miller families, all the extra hands help make the event a wonderful success. A super thanks goes to Ann and John Murray for donating their excellent Cubs tickets for the putt putt prize. Thanks also to the people who passed on the golfing but still made generous donations. The one thing that remains the same is Liam’s incredible personality. He has started making friends in the playroom and chats with anyone who will listen. I will say that he still has shy days, but it is so wonderful Liam can be so ease in the hospital. He has a bit of a routine around here. Sleeps late, plays hard all day in and out of the play room, naps from 6-8pm and then parties in the halls till after midnight. The late night walks are fun, scavenging for lollipops and just a change of scenery. I think he likes the night walks because it is quieter without so many people roaming around. We over pack every time. We bring food, blankets, pillows, toys, toys and more toys. This week I planned for Liam to sleep all day everyday and the absolute opposite happened. We had to dig deep for rainy day kind of games. It was awesome to have him up about and eating better than ever before(In hospital) The Antibodies have a significant allergic reaction risk along with a load of other complications. Thankfully we have been blessed and I feel that I might have jinxed us this week by talking with a doctor about Liam’s great progress. She just finished saying that none of her other Pt’s had made it so far without having to stop related to severe allergic reaction, when Liam’s lips began to swell. We have had hives before but never serious mouthswelling. We are pioneers in a way withthis study, it hasn’t been administered at Children’s for years and the course wasn’t completed related to severe reaction. The lip swelling was the furthest the reaction went. Liam never had difficulty breathing. We were allowed to continue the administration at 5o% infusion rate which turned the infusion from a 10 hr infusion to 20 hrs:) Not such a big deal in the long run. Liam’s pain was always one of my biggest fears and he tolerates everything with fleeting episodes of discomfort,managed well with pain meds. In the past we have gotten home and Liam sleeps and sleeps for a week, only time will tell if this time will be similar. We are so lucky, unbelievably lucky to be given the opportunity and any drip of the antibody is better than none at all. Our final planned admission is on Father’s day for one week. We will not be offically finished but the rest should be managed outpatient in the Oncology Clinic or Day Hospital. I am focusing on spending some well deserved time to resting, recouping and restarting life as soon as it’s over. Join us for some fun in the sun on Saturday, June 18! 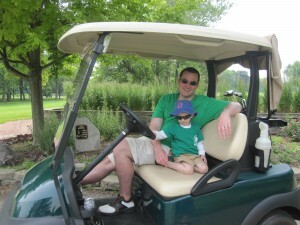 On behalf of the Kelly/Murtagh Family we would like to invite you to join us for a fun filled day of golf in support of Liam Kelly at the Liam’s Gang Golf Outing. 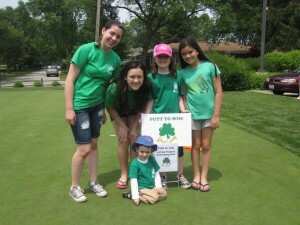 The outing will be held Saturday, June 18 at Mount Prospect Golf Course. 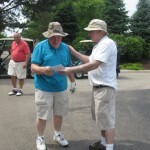 The price for the outing is $125 per golfer and includes 18 holes of golf with a cart, food at the turn and a goodie bag. 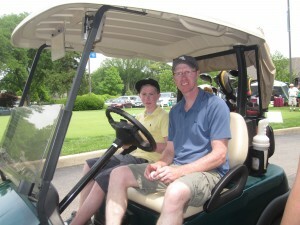 Please contact Mike Murtagh (event organizer) no later than June 1st with your foursomes. …If you don’t have a foursome, please let us know and we can match you up with a group. Once we have a good idea of attendees we will send out tee times, directions and other details. 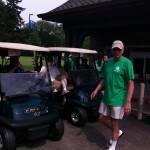 If we have a large number of golfers coming from the city we will try to organize a shuttle. 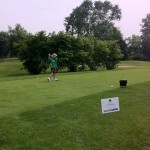 We are also looking for corporate hole sponsors so if your business would be interested please contact Mike. We look forward to seeing everyone out on the links! Golf has always been a part of our family fun so we just wanted to invite anyone who might be up for a round. For those that cannot golf, we are also planning a good old fashion party in the fall when all our stays at children’s hospital will be finished. So stay tuned for the details, we look forward to dinner and celebrating with each of you that has been so supportive over the past year. Check out my new hearing aides! 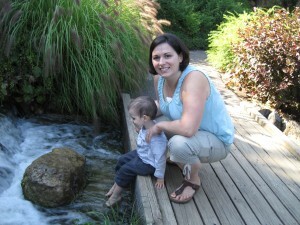 In order to get to this point in Liam’s treatment, he had to endure some very serious drugs that each have a laundry list of side effects that can present themselves now or even a few years down the road. One of the first drugs the Oncologist warned us about was a platinum based chemotherapy agent known as Cisplatin. One of the side effects of Cisplatin is ototoxicity, or hearing loss caused by damage to the nerves. We started noticing Liam was having a harder time hearing things after our second go around with cisplatin in his final round of Chemo. Since ototoxicity is a known side effect, we had been conducting audiology examines with Liam every few months to keep tabs on any hearing issues. 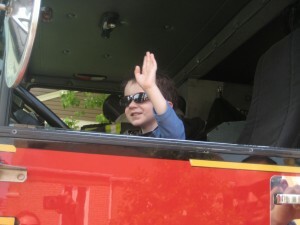 Liam was recently fitted for special hearing aides to help boost the hearing he still has. The video is a simulation of what things sound like to Liam without his hearing aides, you can see the audiologist toggle the settings from normal range to Liam’s range. It is amazing what he can adapt to, even when his aides are out he has found ways to compensate for the hearing loss.